The photographic works by the Italian artist Gigi Piana explore the concept of identity in the whole range of its possible meanings. Printing directly on transparent acetate, Piana creates “two-dimensional sculptures” by weaving together different stripes of previously cut photographs. 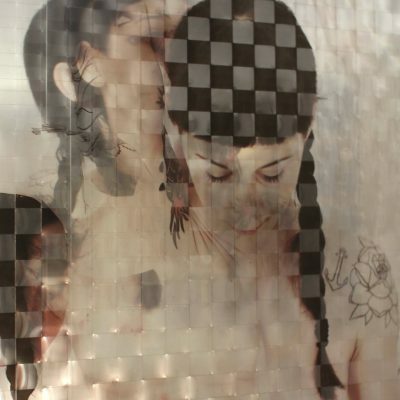 The use of this particular material allows the artist to combine from two to four different photographic images while maintaining the synergy between their single elements. Result of this process is an actual work in motion where the dynamic movement of the human body seems to resist the fixity imposed by the photographic medium. Here, the “hinc and nunc” of Cartier-Bresson’s decisive moment makes way to a more fluid temporal dimension, alluding to that non static idea of identity which is at the core of the artist’s production. 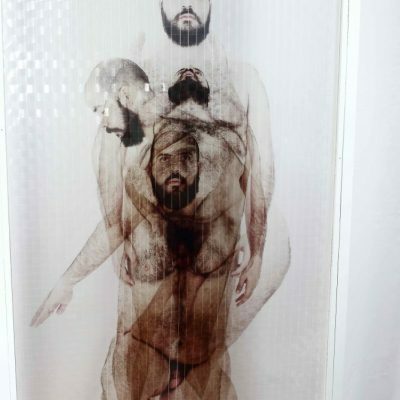 If the twine between the different sections translates for the photograph into a new three-dimensional entity, it becomes for the figures an opportunity to start a dialogue with their different sides and aspects, bringing out the dissociative essence of human identity. Gigi started the series of work “Piccoli Movimenti Rivoluzionari” (Little Revolutionary Movements) already in 2016 with the project “STILL – Body Experience With Digital Brain” winner of the art prize “ORA! LINGUAGGI CONTEMPORANEI, PRODUZIONI INNOVATIVE” promoted by the company San Paolo, developing an idea of the dance coreographer Daniele Ninarello, in collaboration with interactive designer Emanuele Lomello, and NABA – Nuova Accademia di Belle Arti di Milano – coordinated by Silvia Limone, the photographic project was realised with the collaboration of Ewa Gleisner, a Polish photographer with whom Gigi Piana has been collaborating since 2012. You will find extracts of the series from 2nd June to 6th July in our Project Room. Italian visual artist experienced in installation, performance and video. Gigi developed a very personal language by using see-thru materials, red lines, writing, minimal elements in whole his productions: artworks, performances and installations. – at present state and futuristic previsions. Gigi Piana lives and works between Turin and Biella, Italy.